San Mateo County is considered ground zero for sea level rise in the Bay Area. With both Bay coastline and Pacific Ocean coastline, the County faces challenges in adapting from differing geography and impacts as the climate continues to change. With $24 billion in assets potentially at risk, the County is in the process of developing a vulnerability assessment that will determine what is most at risk in San Mateo, to inform adaptation and mitigation strategies in the coming years. Building on the success of Climate Access’ pilot project Here Now Us in Marin County, we have partnered with San Mateo County to produce the Look Ahead – San Mateo project, installing two Owlized viewfinders at Coyote Point from August to December 2016. 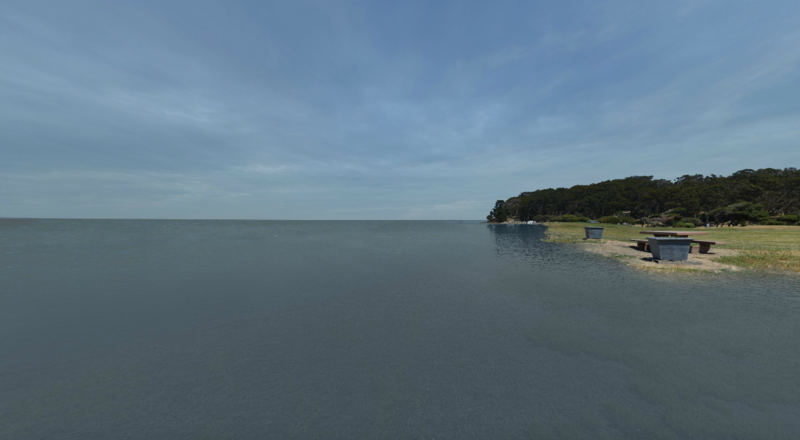 The viewfinders are a modernized vista viewer that allows people to see a photorealistic first person view of what the location they are standing in could look like with sea level rise. 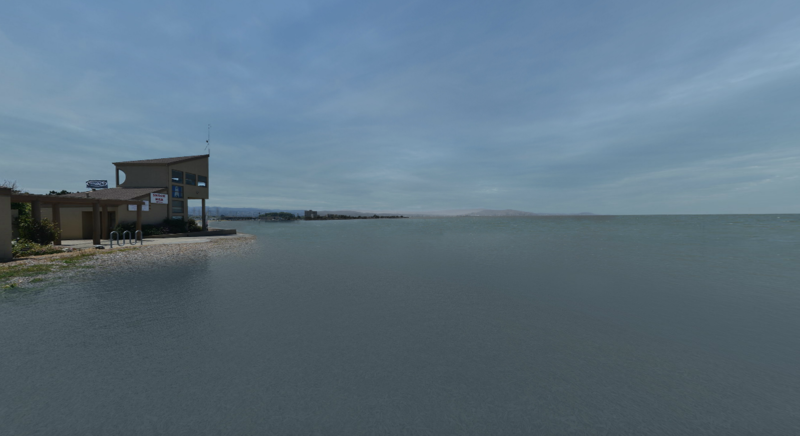 Within view of San Francisco International Airport, Coyote Point Recreation Area is the only Bayside recreational beach in the County and is already experiencing impacts from rising sea levels and storm surge. The Owl viewfinders are installed beside the Bay Trail path, next to the Boardsports California pavilion and give visitors a view of what the County is currently doing at Coyote Point to adapt to rising seas in the San Francisco Bay as well as a vision of what future sea level rise could look like with and without action being taken. The Bay Trail at the Coyote Point beach is already being damaged from waves, with the path being overtopped by water during a King Tide event with storm surge. To combat this and protect the public recreational space, the County Parks Department is undertaking the Eastern Promenade Rejuvenation Project that will move the car park back to allow for an expansion of the beach that will be raised above 2ft of sea level rise. 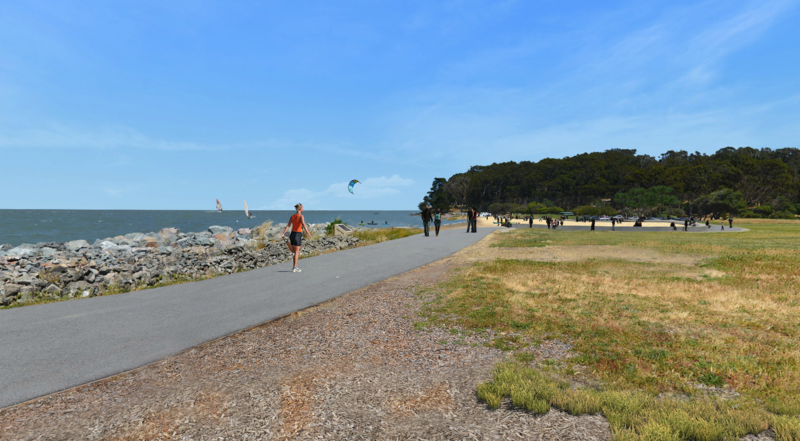 The managed retreat plan will move amenities back from the high water line and will ensure ongoing enjoyment of Coyote Point as well as protection of the foreshore Bay Trail. 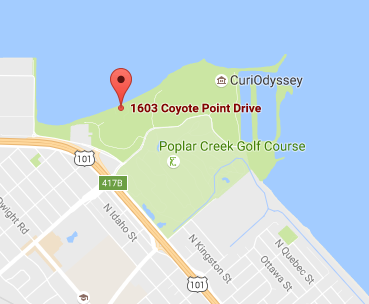 If no action were to be taken, more extensive flooding will occur at Coyote Point, putting at risk infrastructure as well as homes, businesses, and transport, with Highway 101 (one of the major highways in California) at risk of flooding with only 50cm (20in) of sea level rise and a storm. With approx. 20cm (8in) of sea level rise having already occurred over the last century in San Francisco Bay and a current rate of increase at 1.94mm/year, it is clear collective action to deal with sea level rise will need to be taken across the Bay Area in the near future. A view of the ‘future flooding without action’ scenario in the owls. Even as communities take action to adapt to current flooding, sea levels will continue to rise and require other strategies to adapt. In the Bay Area, this could include moving structures inland, restoring wetlands, expanding oyster reefs, sandy shoals and installing boardwalks to ensure continued access to beaches and recreation. It’s not yet known what strategies will need to be deployed in the Bay Area, so the final visualization was imagined by landscape architect Nate Kauffman, developer of the Live Edge Adaptation Project (LEAP). A view of the imagined future adaptation scenario. Over the five-month installation, Climate Access will work closely with San Mateo County’s Sea Change SMC project to host groups at the OWLs and engage with community groups to help the County promote their vulnerability assessment outreach. The project had a media launch event on August 4th, which garnered wide media coverage including KTVU news the Mercury News and the San Mateo Daily Journal, including one reporter so committed to the story that he waded into the ocean! Top image via (cc) Amy Huva. All visualization images (c) Owlized.